Why did I choose Smartly? The MBA program is an elite online program that offers a free MBA to the best & brightest. The rigorous curriculum consists of courses from nine subject areas, including accounting, finance, marketing, and other core areas of business education. However, Smartly is different from a traditional MBA in the sense that our instructional method is completely digital, and you can complete the program on any device. There are no lectures or PowerPoints, and students interact with the platform every 8.7 seconds on average. Thus, you can earn your degree concurrently with a full-time job or another degree. 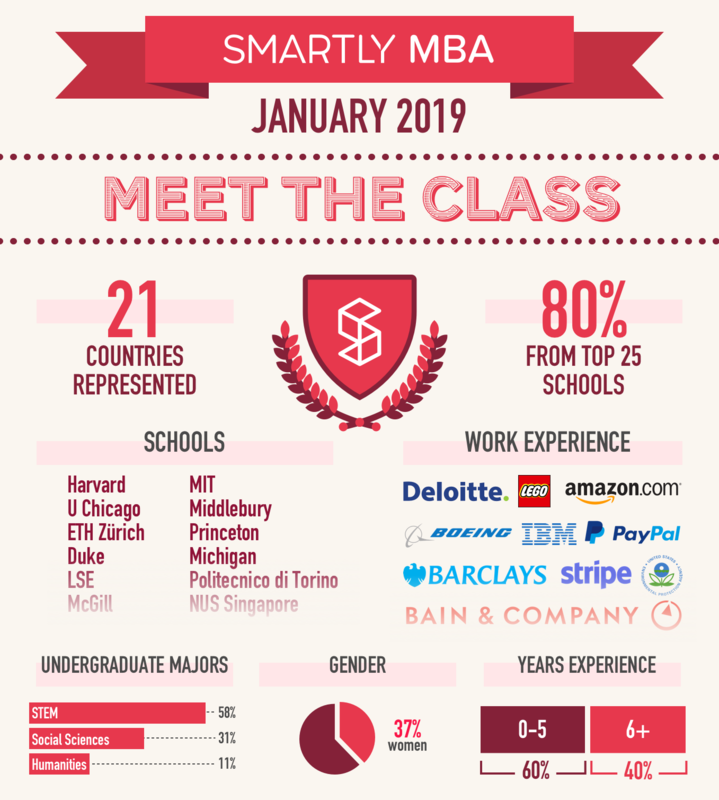 Smartly’s MBA also ties the education directly into career development. Upon enrolling into the program, students join Smartly Talent, which is an alumni and employer network that helps Smartly students connect with each other and discover new job opportunities. What do MBA students learn? Aligned with the world's leading business schools, the MBA degree comprises courses across business disciplines. Smartly's program consists of nine subject areas, including Business Foundations, Accounting, Finance, Marketing, Economics, Business Strategy, Data and Analysis, Leadership and Management, Supply Chain and Operations. Smartly's talented team of content creators, editors, and subject-matter experts, including professors from elite institutions, builds each course with smart, motivated learners in mind to ensure that the courses meet the challenges of a rapidly evolving business environment. Smartly lessons are bite-sized and interactive, crafted using their proprietary learning platform. Smartly is expanding the possibilities of online education. The Smartly program has been validated through formal research. In an independent academic study, Smartly students performed as well or better than MBA students from HBS, Stanford, Wharton, and Fuqua in a test of accounting, and performed as well as the MBA students in a test of finance. While there are benefits to a traditional physical school including in-person interactions among professors and students and collaborative assignments between students, Smartly is proud that the quality of the instruction rivals that of the top-10 business schools worldwide. Is the Smartly MBA degree licensed? The MBA program offers a licensed MBA degree. Smartly is licensed by the Washington DC Office of the State Superintendent of Education, Higher Education Licensure Commission. Accreditation, or the formal recognition by other institutions of higher learning, is a multiyear process, often taking over four years from when the first students enroll in a new program. As Smartly is relatively new, the program is not yet accredited. In the meantime, the goal is to provide an elite MBA education in a non-traditional medium and tie the benefit directly to the job market. The success of Smartly graduates in the job market is the driving force behind Smartly’s mission. 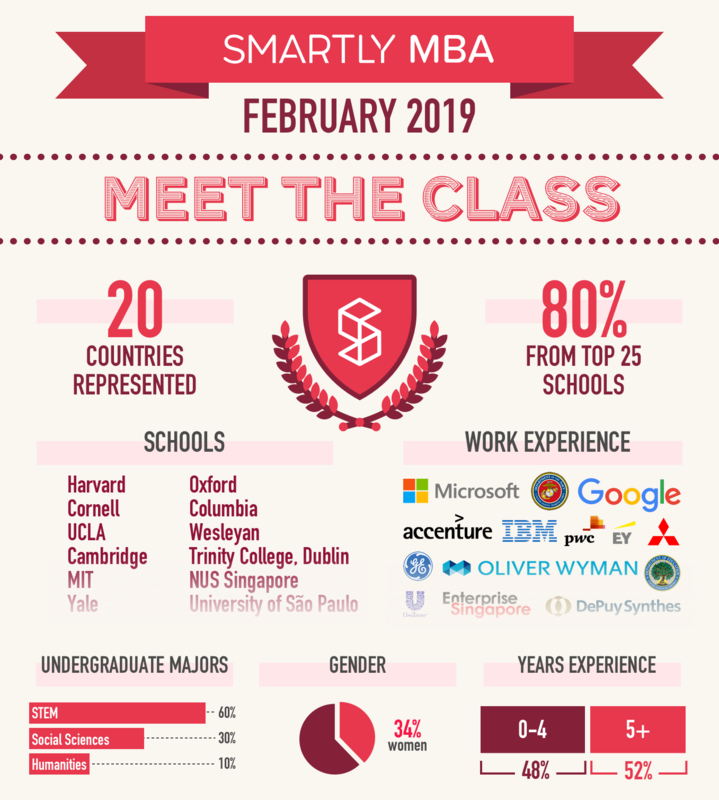 I’m currently an MBA student at Smartly, which is a new type of university. The MBA program is very selective, with candidates coming from elite backgrounds at companies like McKinsey, Google, and Facebook. Smartly also offers a recruiting platform to help match their students with great companies. Browse some of our digital resumes here: https://smart.ly/hiring. Sign-up takes less than 5 minutes, and it’s all free. If you have any questions, you can reach out to Smartly Career Services (talent@smart.ly).